Recruitment Talk by Jetta Co. Ltd. Registration will be closed at 11:00, 1 Mar 2019. Those who are not registered may try to walk in on a first-come, first-served basis. Jetta is an Original Equipment Manufacturing company in toys and consumer products industries. We offer comprehensive engineering supports in product development, including design from concept, prototype making and mold making to our customers. For Graduate Scheme A Trainee, successful applicants with qualified degree in Mechanical Engineering (MCL)/ Manufacturing & Industrial Engineering (MIE) disciplines will follow HKIE Scheme A Training and rotate to 9 departments including research & development, engineering and production during the 2 years training period to learn various engineering, manufacturing and operation skills. 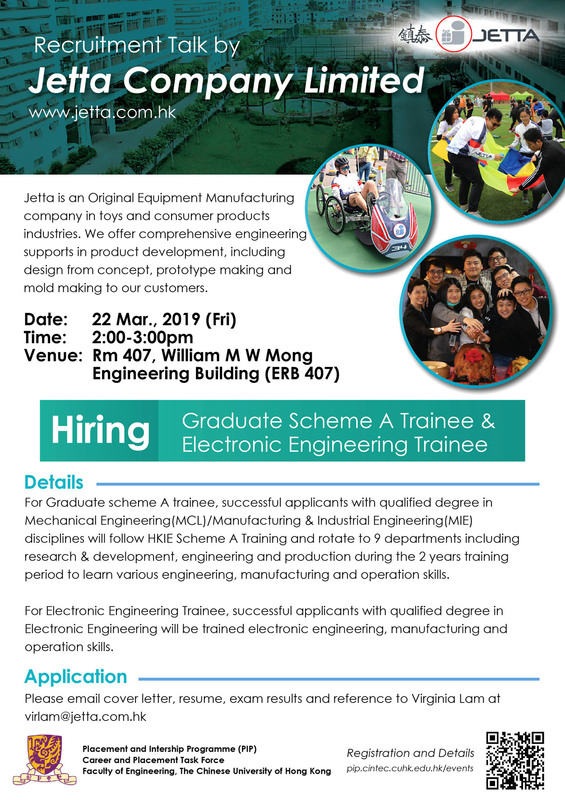 For Electronic Engineering Trainee, successful applicants with qualified degree in Electronic Engineering will be trained electronic engineering, manufacturing and operation skills.